Meeting Hugh Dillon at work during filming of Flashpoint. Today was a bitter sweet day for me. It is the beginning of my birthday weekend, had an exciting film shoot at work and a stark reminder that life keeps moving forward. My Mother's ashes were laid to rest in Nova Scotia today, she passed in January and her funeral was at that time. Today was a small graveside service with my Dad, a few family members and dear friends. The timing of the service was short notice and I hadn't planned on going down for it. I arranged to have flowers laid during the service as a way of taking part. Work though, gave me a distraction. Also very short notice was the news that "Flashpoint" was going to be shooting their final episode on campus. I'm a fan of the award winning show, and this is their 5th and final season. The campus was hopping when I arrived at work at 7am, it takes a lot of people to film a TV show. I got a "good morning" from Enrico Colantoni, a great look at Amy Jo Johnson, who I have been a fan of since the TV show Felicity. But the highlight for sure was getting to meet and have my picture taken with Hugh Dillon, legendary front-man of The Headstones who plays Ed Lane on the show. My Mom and the service were never far from my mind, but it was hard to concentrate on work, or anything really, with all the crew and actors running around, I got caught up in the excitement of it all and the day flew by. I was also given birthday presents and cards from a couple of co-workers/friends and in the afternoon I was taken completely by surprise when I was presented with an ice-cream birthday cake and my team of co-workers singing happy birthday to me. 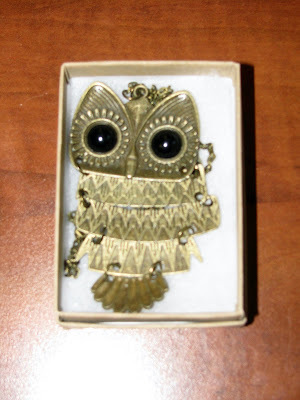 An Owl necklace from Sabrina, I love it! And then I came home to a dozen red roses waiting for me from Rob, not a regular occurrence in our home. Lovely surprise waiting for me when I got home. I can't help but think that there was some divine intervention going on. Everything falling into place like that, to keep me busy and distracted so I couldn't dwell on events and places I couldn't be. I feel I had a little nudge from Mom today to let me know that it's ok to celebrate my birthday, enjoy my life and be happy. Thanks Mom, I will.